The adage "everything is better wrapped in bacon" doesn't apply here. Dove meat is more versatile than you might think. While the thought of a bacon-wrapped dove breast will surely make your mouth water, think about trying something new with your next harvest. 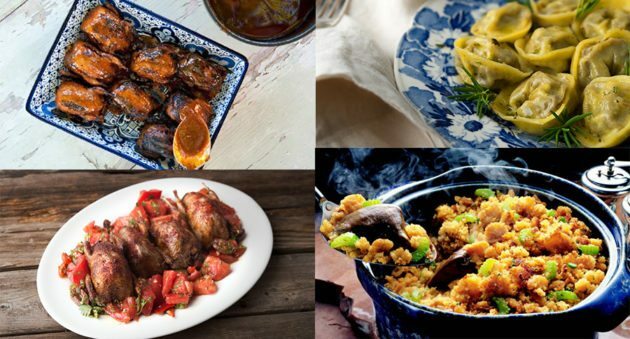 These nine dove recipes are sure to become tried and true favorites. Recipe courtesy of: Hunter. Angler. Gardener. Cook. Add doves and simmer until tender, about 20 - 30 minutes. Remove doves to cool. Return broth to a boil. Get your grill hot. Set the doves breast side up and cook them over medium-high heat, with the grill cover closed, for six minutes. Open the grill cover and turn the doves over. Brush the birds with some bacon fat. Let them cook this way for a minute or two, just to get a little crispy. Turn the doves on their sides and grill for another minute or two -- for each side. Brush with more bacon fat. Roll out the dough in a pasta maker or with a rolling pin. Use something round to cut out circles for tortellini. Put a heaping teaspoon of filling in the center of the circle and fold it into a half-moon, and wet the edges with a little water to seal. This recipe makes about 40 to 45 tortelli, or twice that many tortellini if you make them small. Set each one on a baking sheet that you've dusted with semolina flour or fine cornmeal. It's time to get creative with your dove recipes. Dove season is upon us; get out and get some birds and treat yourself.